A beautiful area of central France with a fascinating history of human habitation since the late Stone Age. The town of Vallon Pont d'Arc serves as the staging area for much of the outdoor sporting activity. It is also the closest town to the Caverne du Pont d'Arc, the amazing reproduction of the Chauvet Cave, with its exquisite 36,000 year old cave paintings. In Vallon Pont d'Arc you'll find restaurants, hotels, tourist information, places to rent canoes or kayaks, beach ware, and a variety of other clothing, equipment, and souvenirs aimed at tourists. Wondering what the Pont d'Arc is? 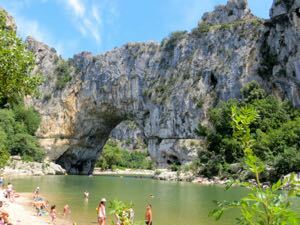 It's a natural bridge just a few kilometers south of the town of Vallon Pont d'Arc. Today it includes a popular swimming beach. Although not technically in Provence, a visit to this area makes a great day trip from the northern Provence town of Orange. Here's how to do it. Above, Swimmers enjoying the beach at the Pont d'Arc.